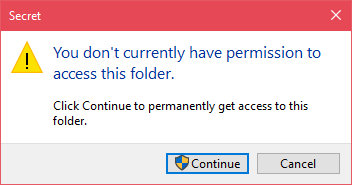 It's not every day but every once in a while you might face an error like "you currently don’t have permission to access this folder" while trying to open, modify, or delete a folder in Windows. If you click on the Continue button in the error window, Windows will show yet another error "You have been denied permission to access this folder". Simply put, Windows doesn't allow you to access, modify, or delete the target folder. In other words, the folder restricted because you don't have sufficient permissions. But, all is not lost. You can easily get access to restricted folders in Windows with just a few clicks. Here's how. Why Do You Face Insufficient Permissions Error in the First Place? Even though the error message is fairly obvious, you might be confused whey don't I have permission to modify or delete the folder on my system. There are several reasons for this kind of error. For instance, if the folder or file is created by the system administrator and if you are not a system administrator, you might get "You don't have permission to access this folder" error when trying to modify or delete. The same is applicable to system folders. Additionally, the same logic is applicable to user-specific folders. i.e, if the folder is created or owned by another user, you cannot modify or delete the said folder without administrative privileges or proper permissions. The other reason might be that if you have multiple users on your system, the other user might've deliberately denied permission to your user account from accessing the folder. For obvious reasons, some system folders and files cannot be deleted even if you have the administrative privileges. This is because, in addition to not having proper permissions, the ownership of those system files and folders are with the System, not any user. This helps protect important files and folders from being accidentally deleted or modified by unwanted programs, like viruses. No matter the reason, if you are the system administrator, you can easily get access to the target folder by fixing you currently don't have permission to access this folder error by adding necessary permissions. Here's how. The below method working in Windows 7 and 8 too. To fix this error, as I said earlier, you have to add proper permissions to the target folder. Once you have proper permissions, you can access the folder without any problems. 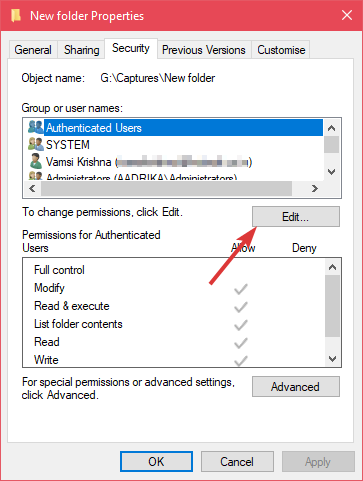 You can add or modify permissions from the folder properties window. Just follow the steps and you will be able to fix the error pretty soon. 1. 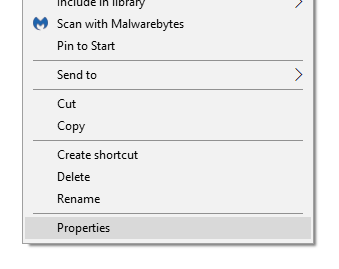 First, right-click on the problematic folder and select "Properties" option. 2. In the folder properties window, go to the "Security" tab. Click on the "Edit" button. 3. The above action will open another window. Here, see if there is a user named "Everyone" in the "Group or user names" section. If there is, ignore the next step and proceed to the step 5. If not, click on the "Add" button. 4. 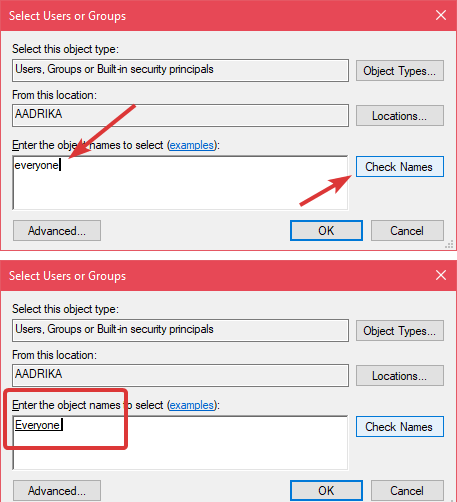 Now, type "everyone" in the "Enter the object names to select" and click on the "Check Names" button. This action will turn it into an actual user/object name. Click on the "Ok" button to continue. 5. 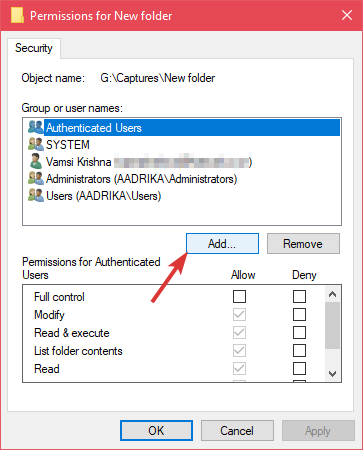 In the Permissions window, select "Everyone" under Group or username section and select the "Allow" checkbox next to "Full control" under the permissions section. Click on the "Ok" button. 6. That is it. Now, every user on your system, including your user account has full control over the folder. So, you can modify or delete the folder depending on your need. 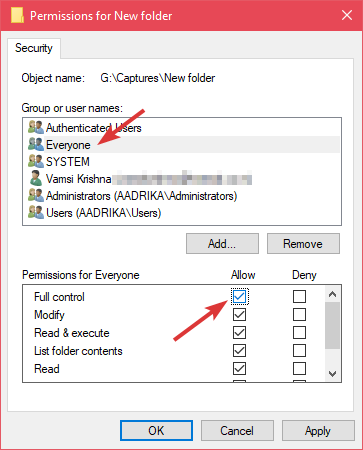 If you don't like giving everyone the full control permission, you can replace "everyone" in step 4 with your own Windows username. This makes sure that only your user account has full control over the folder. Isn't that simple? With just a few clicks, you can take full control of any folder in the Windows and fix the error like "you currently don’t have permission to access this folder". Hope that helps. Comment below sharing your thoughts and experiences about using the above method to get access to a restricted folder in Windows 10.